Shannon Watts, the reputed founder of Moms Demand Action for Gun Sense in America, the lead Bloomberg-funded anti-gun group, started an Internet meme in March about dress codes on airlines when she tweeted that two teens on her flight were denied boarding because they were wearing leggings. 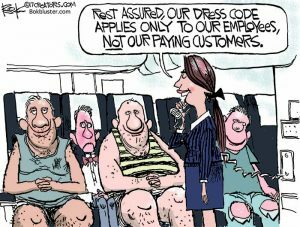 Online umbrage raged until United Airlines, the same outfit that later forcibly ejected an alleged overbooked passenger, explained that the girls were flying on an airline employee pass, which has a different dress code than that for paying passengers, at which point most people concluded that the airline was well within its rights to enforce their policy. However, it left most travelers surprised that modern airlines had any dress codes. The ongoing communications sniping involving the Trump Administration and the press has had an unsettling social and symbolic component. Time and People magazine will not hold their glitzy, celebrity-filled party the night before the White House Correspondents’ Dinner, the magazines confirmed to Politico media correspondent Hadas Gold in March. The move follows several other high profile parties being canceled for the annual event, during which the Washington media, politicians, and often celebrities gather to celebrate journalism awards, scholarships and normally to toast the president, Gold continued. President Donald Trump has announced he will not attend the dinner, the first time a sitting president has skipped the dinner in decades, except for President Ronald Reagan in 1981, who was recovering from the assassination attempt by John Hinckley. There were still many other unknowns about the dinner, which is scheduled for Saturday, April 29. Gold continued by saying that Vanity Fair and The New Yorker have also announced they are canceling their annual events, which like the Time and People magazine party were normally the most celebrity-filled events of the weekend. Other parties, such as MSNBC’s after-party, have not yet been announced. Typically a Republican president attracts fewer Hollywood-types to the weekend, but Hollywood has been particularly anti-Trump, and thus far it seems as though this year’s dinner will be a much more subdued affair, which may have led to several of the parties to be canceled, Gold explained. That’s all but certainly a reference to the relationship between Trump and the media, which he routinely derides when faced with negative news about his administration, Heil wrote. “Chances of another year’s worth of news cycles improving Trump’s relationship with the press? Not so yuge, we’d say,” Heil commented. Bob Woodward and Carl Bernstein were scheduled to speak at the dinner and present awards. The White House Correspondents’ Association has announced that Greg Jaffe of the Washington Post, Edward Isaac-Dovere of Politico, and David Fahrenthold of The Washington Post are the winners of its 2017 journalism awards. When school authorities in North Carolina suspended a 5-year-old girl from elementary school because she was playing with a stick that vaguely resembled a gun, it sparked national outrage. But a teacher took the child to the principal’s office and things went downhill from there. Caitlin was suspended from school for one day, Fox News reported. Mrs. Miller had to explain to her daughter why she could not play make believe games because of school policy, the story noted. European Union (EU) lawmakers have voted to toughen the bloc’s gun laws and close loopholes exploited by attackers in France, according to the Associated Press. The lawmakers passed the rules on March 14 in a 491-178 vote, with 28 abstentions. Disabled weapons, some of which are too easy to reconvert, will have to be declared to national authorities when they are made safe. Such weapons were used in the 2015 attack on the offices of the French satirical magazine Charlie Hebdo in which gunmen shot dead 12 people. Tougher controls also will be imposed on semi-automatic weapons with high capacity magazines. The EU parliament in Brussels took the vote on stricter gun laws even though the people of many member nations were lobbying for few restrictions on small arms for self- and home-defense. Authorities almost immediately offered a $2,500 reward for information leading to the arrest of suspects who were involved in a destructive Florida gun shop robbery on April 9. According to Fox News and TheDrive.com, four people were involved in the caper. They smashed into the store using a lifted Toyota Tundra pickup. In 31 seconds, the quartet had grabbed a number of firearms and a fair amount of ammunition. In the process, they destroyed the store front of the Sunshine State Armory in Zephyrhills. The thieves weren’t finished with their destructive behavior, however. News reports said the truck was found in a wooded area about a mile from the gun store. It had been set on fire. 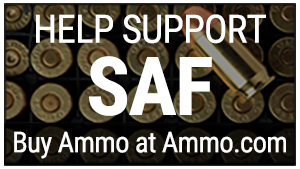 Plaintiffs in the Soto v. Bushmaster et all case against Remington, a firearms dealer and distributor filed their opening brief in the Connecticut Supreme Court recently. The plaintiffs continue to claim that the lawful manufacture, distribution and sale of an AR-15 type rifle constituted negligent entrustment, and the Protection of Lawful Commerce in Arms Act (PLCAA) does not apply. Enacted in 2005, the PLCAA protects manufacturers, distributors, dealers, and importers of firearms from vexatious litigation. In October 2016, the Connecticut Superior Court upheld the PLCAA and dismissed the suit against the Remington companies, a distributor, and the dealer who legally sold the Bushmaster rifle to the of the elementary school shooter. The Trump White House is not the only entity battling the media these days and the Army’s Modular Handgun System contract awarded to Sig Sauer may have hit a snag as well. Glock USA has filed a protest with the government over the Army’s award of a new pistol contract to competitor Sig Sauer, according to documents filed with the Government Accountability Office (GAO), as reported by Army Times. The National Safety Council’s “Injury Facts -2017 Edition” shows a 17 percent decrease in accidents involving firearms from 2014 to 2015, a period when gun sales soared, Fox News reported. There were 489 unintentional firearms-related fatalities during that time period, the lowest total since record-keeping began in 1903, accounting for less than 1 percent of accident deaths. This decrease, which was the largest percentage decline of any category cited in the NSC’s report, came in a year that saw record-high firearm sales. Legislation designed to allow for concealed carry of firearms nationwide is gaining additional backers on Capitol Hill. More than a third of the House of Representatives signed on to co-sponsor H.R.38, the Concealed Carry Reciprocity Act of 2017, introduced Jan. 3 by Rep. Richard Hudson (R-NC). There are now 176 bipartisan co-sponsors. 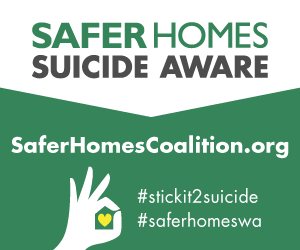 In the Senate, S.446, the companion bill introduced by Sen. John Cornyn (R-TX) on Feb. 27, also has more than a third of the Senate’s support, with 36 co-sponsors. On March 31, Colt congratulated Team Colt shooter Maggie Reese on taking High Lady at the 2017 Superstition Mountain Mystery 3-Gun event, in the Open division. The match was held March 24-26 at the Usery Mountain Shooting Range in Mesa, AZ. Reese is a three-time Superstition Mountain Mystery 3-Gun winner, with victories in 2009, 2010, & 2014. 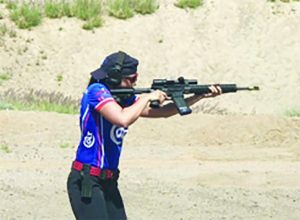 She trusted the reliability and accuracy of her Colt LE6920 for the rifle stages of the match, with targets out to 500 yards. Reese competing in open division allows for multiple optics and bipods, with no limit on magazine capacity. Approximately 350 competitors went through the 11 stages. The Senate squabbling over President Donald Trump’s nomination of Appeals Court Judge Neil Gorsuch to fill the vacant seat on the US Supreme Court is only one issue of national concern. Many legal profession observers are concerned that there are currently 126 vacancies in the federal court system, which is slowing a growing backlog of federal court cases. So far, Trump has not submitted the names of nominees for those openings at the district circuit court and appellate court levels, but when he does there could be further partisan wrangling in Congress over the consent rule. The Oklahoma woman now facing charges of first-degree murder and burglary in connection with the high-profile fatal shooting of three teenage suspects by a man armed with an AR-15 rifle is believed to have been the mastermind of the burglary-gone-bad, according to Fox News. Elizabeth Marie Rodriguez, 21, of Oologah turned herself in after three teens, identified as Jaykob Woodrif, 16, Jacob Redfern, 17, and Maxwell Cook, 19, were killed in the botched caper. Fox identified the shooter as Zach Peters, 23, son of the homeowner whose house was the target. Published reports say the burglary trio entered the home wearing masks and black clothing. They had a knife and brass knuckles, but Peters was armed with a semiautomatic rifle. Initial reports indicate there was a “short exchange of words” and then Peters opened fire. There was some speculation that Peters acted within the parameters of Oklahoma’s “Stand Your Ground” law, according to Fox News affiliate KOKH News in Oklahoma City.